Our first ever DEFUND ABORTION RALLY last October kicked off a major push in Ontario, and hopefully, across Canada, to defund elective abortions as medically unecessary. To assist this effort, we have developed the petition below. 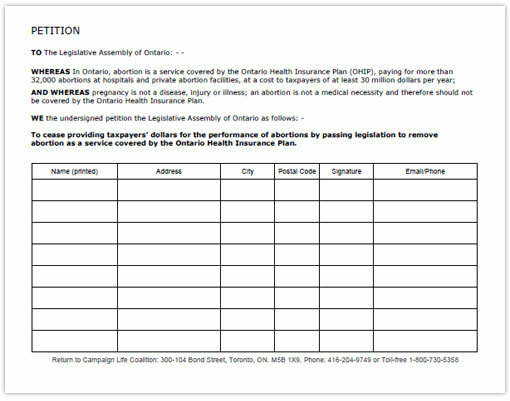 So far, more than 20,000 Ontarians have signed the petition! Please print off copies, circulate it amongst the people you know for signatures, and then return completed pages to Campaign Life Coalition's Toronto office. Once sufficient signatures have been gathered, we will make arrangements to have them read aloud by MPPs in Ontario's legislature. Signatures must be written directly on the face of the petition under the text of the petition. The petition can be double-sided as long as the text of the petition is on both sides of the page. Click the image below to open up the petition in PDF version. Here is a version en français.